It has been a few months since my trip to Japan, but I wanted to share these images from the Honda Collection Hall. This museum has long been a pilgrimage for me, so seeing it in person was a lifetime event. Although getting here was a big challenge due to the difficulties of renting a car in Japan, it was well worth it. 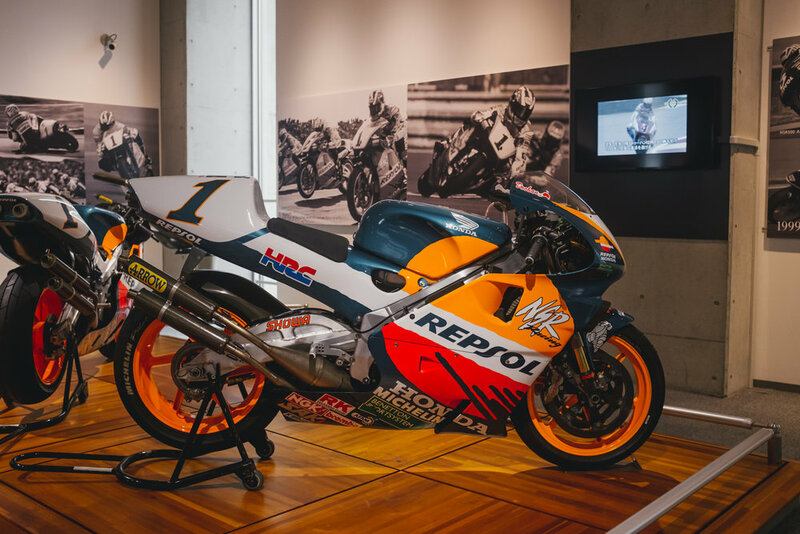 The museum has three levels: the first being a lobby, gift-shop, and a display room, the second being consumer vehicles, and the third being race vehicles. As an aside, the photos in this post were largely meant to be a personal reminder of the trip, rather than a collection intended for publication. If any of you have tried to do event coverage before, you find that you often have no memory of the event because you were so busy trying to do photography. I wanted to avoid that. Many of these shots, therefore, may be a little more boring and repetitious than I usually present, but I hope you'll enjoy them anyways. I don't know too much about motorcycles, but there was obviously an enormous collection. I won't try to identify these for fear of error, so just enjoy them for the aesthetics, and if you know what they are, feel free to leave a comment of anything that you found impressive! In between the main rooms on the second and third floor were race cars from not only Honda, but their competitors. It was a blast to see some of the cars that my friends and I raced in games like Gran Turismo up close and personal! The room of consumer cars was my favorite, and what I had been looking forward to. I've toured this room so many times on the Google Maps walkthrough, but being there in person was a dream come true. This little park was neat to see because Honda does little videos of all of the cars going around the track. If you are a Honda, I'd recommend checking it out. TYPE ONE was one of the spots that I was most excited about visiting in Japan. For those that might not know, TYPE ONE is the workshop facility of Spoon Sports, a popular tuning and parts company for Honda enthusiasts. Along with Mugen, Spoon is one of the oldest Honda tuning companies, opening up in 1988 in Suginami. They have created many race cars, from third generation Civic hatchbacks, to the top of the line NSX. When we arrived at TYPE ONE after a thirty minute walk from the train station, we were invited in by one of the employees to the upstairs showroom. Although there was a language barrier, we were invited to look around and take pictures. The first car we noticed inside was a meticulously restored Honda S800. A progression of the brand's first sports car the S600, the S800 offered a larger, more modern engine, capable of revving to 10,000rpm. Although the car was designed with the idea of importing it to the American market, no S car would be sold in America until the S2000 in 2000. All of the racecars at TYPE ONE sported Spoon's trademark blue and yellow liveries. Their road cars usually wear a black and white combo. We'd like to wish the gentlemen at TYPE ONE a huge thank you for allowing us to visit. The shop is extremely impressive, clean, and inspiring. For any automotive enthusiast, this is a place that certainly needs to be on your list.